I love seeing people’s homes. I am guilty of trying to catch a glimpse into a home when driving or walking by. I get inspiration from seeing how others put their homes together. I guess I am a bit nosy! When I visit someone’s home, I don’t notice the dishes in the sink (hey, I have plenty of those to look at in my own sink, thank you very much), the crumbs on the floor, or the fingerprints on the windows. I see the mix of color and patterns. 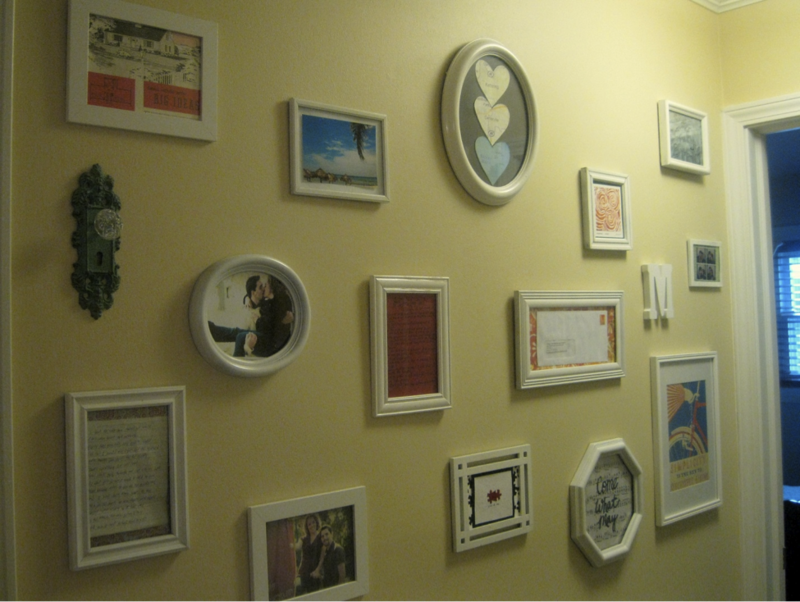 I adore lovely family photos on the wall (who cares if they are a bit crooked?) and the kid’s artwork on the fridge. I love seeing things that are homemade. 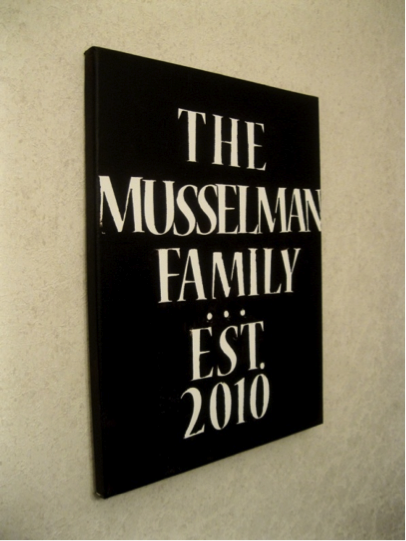 A home reflects the family that dwells there and what is important to them. Recently I went back to Ohio (we moved from Ohio to California 2 years ago) to visit family and friends. 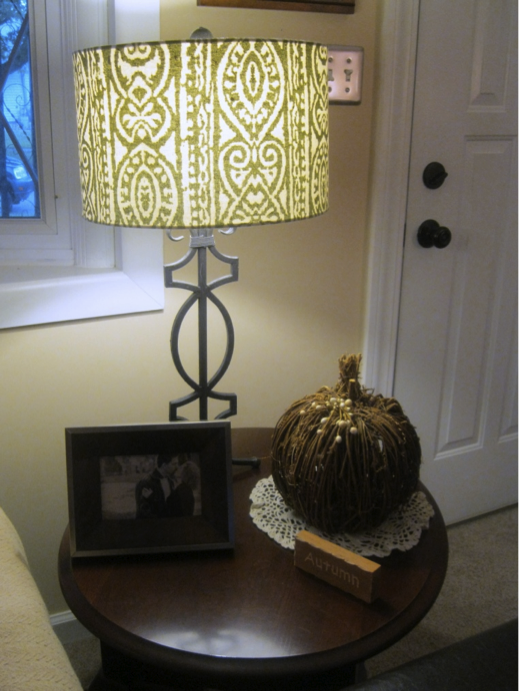 While there, I asked my friend Caity, who loves decorating like I do, if I could snoop around her house and snap some photos. I met Caity when she was dating Caleb (now her husband) as a high school student in the youth group my husband and I helped to lead… so that makes me a bit older (ahem) than Caity. Later as a college student, she helped me paint all my kitchen cabinets black—it took 2 very long, full days (I will spare Caity, and myself, by not posting the pic we took of ourselves while painting). I owe her big time! When Caleb and Caity got married, our son Cole was the ring bearer! Caity has made their first house into a warm and cozy place…it definitely feels like a big hug when you walk in! Her house is lovely, not because it is perfect (although she is a self-proclaimed neat freak), but because of all the personal touches she has made. My favorite spot is in her hallway. 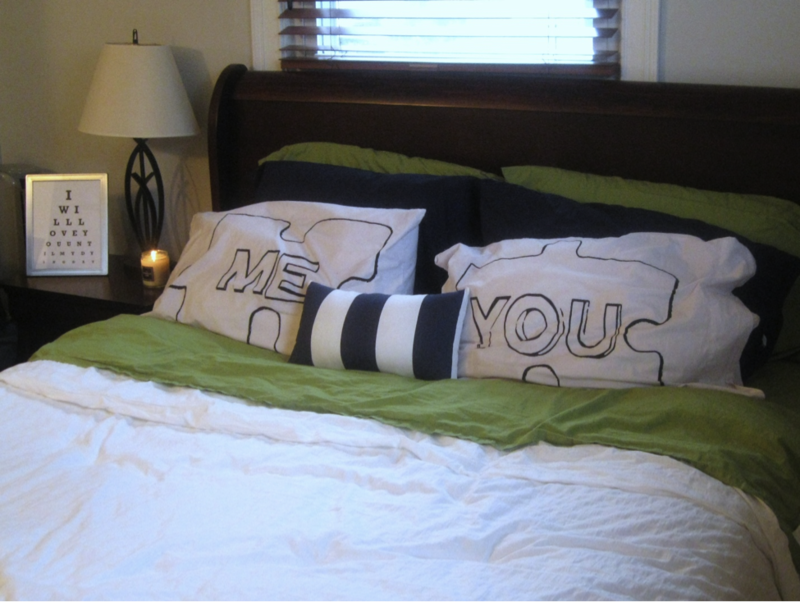 She has taken what would normally be a place to walk right by, and made it into a creative expression of the life she shares with her husband. 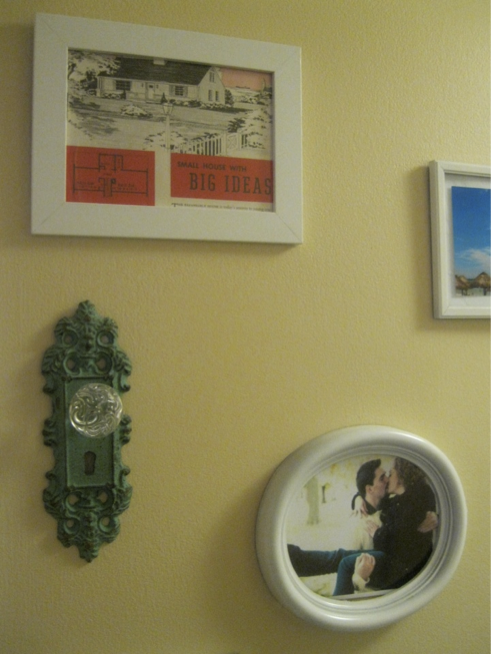 She has an engagement photo, a vintage ad for a home similar to theirs, and even their first piece of mail they got in their new home! She proves you don’t have to spend much (or anything—free piece of mail, people!) to give your home interest. 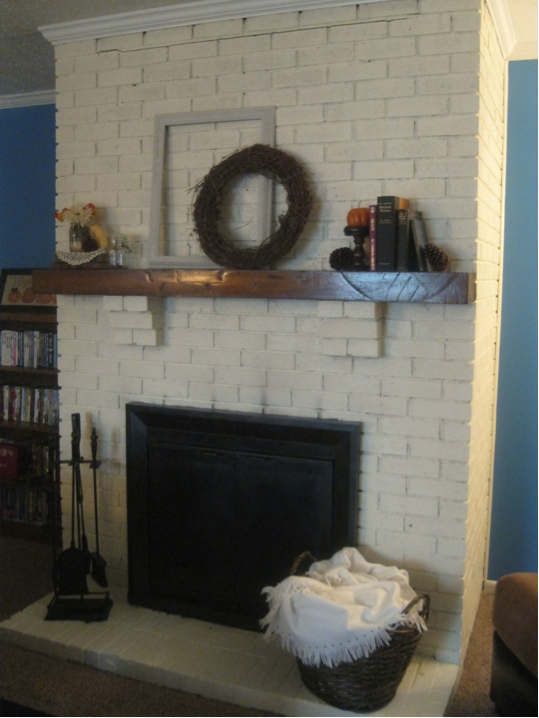 Her Family Room fireplace has painted white brick (swoon!) and was simply decorated with an empty frame, a grapevine wreath and some vintage books. I share Caity’s love for antiques and vintage items. After taking some pics of her home, we decided to head to the thrift store (I desperately miss the thrift stores in Ohio!). Can I say how hard it is shopping at a thrift store when you have very limited luggage space? 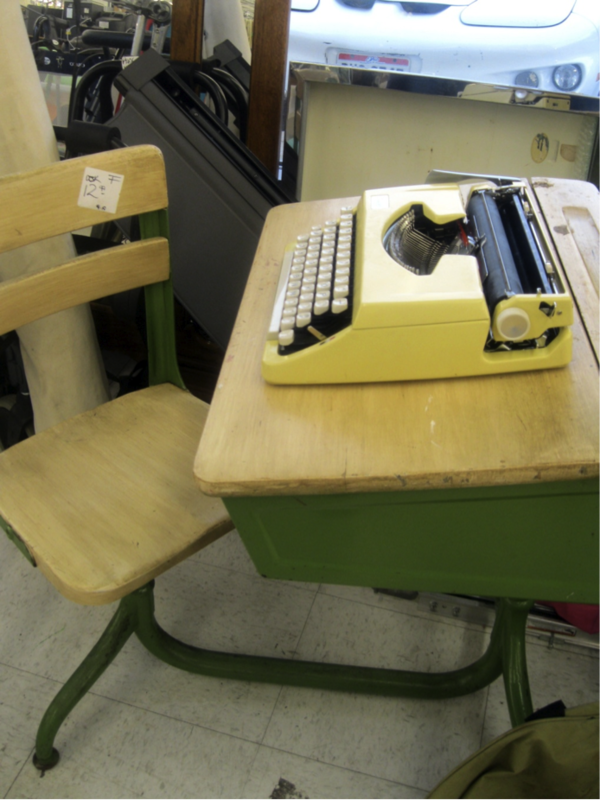 I loved this vintage school desk—the green color was to die for…and only $12! 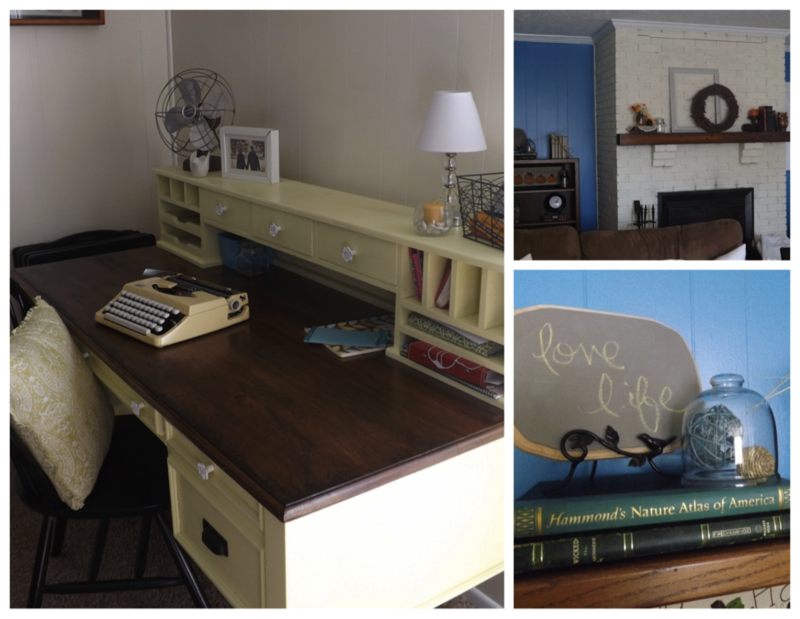 How cute is that yellow typewriter—did you spot it earlier on her desk? Caity snagged it for $6. She also found an amazing antique kitchen scale. It was so fun to hang out with Caity. I am thankful that God brought our lives together and that even though we hardly see each other she is still a dear friend. It is such a blessing to see the home that Caleb and Caity have made together. 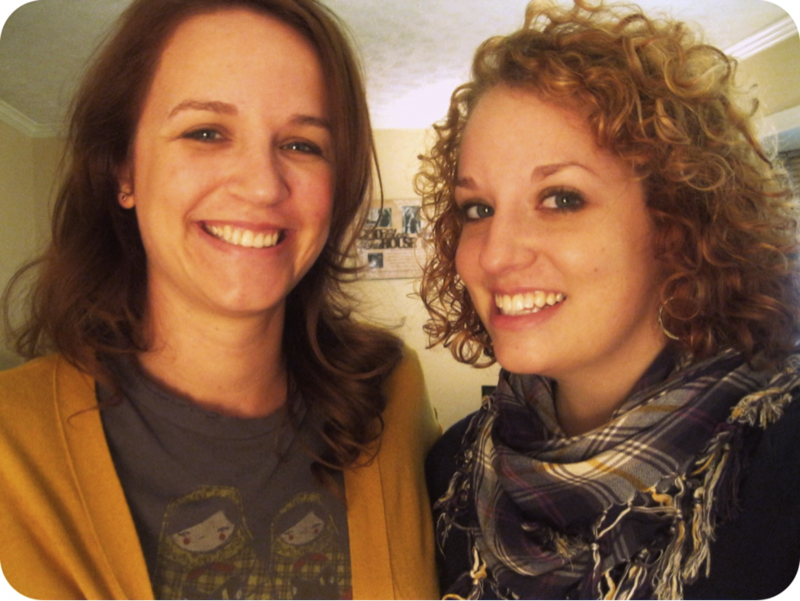 Thanks for still wanting to hang out with me and sharing your home, Caity! So, spill the beans, do you love seeing how others decorate their home? What makes a home warm and inviting to you? I’d like to welcome all our new friends here. We had a wonderful night last Thursday at our first boutique of the Christmas season (yes, Christmas!) and we are glad to have some new blog subscribers, as a result! For those of you who are new, we like to begin each week with an opportunity to praise the Lord and lift up requests to Him together. God is so glorified when we commit ourselves to praying together and then give Him all the praise for His answers! We have much to be thankful for today! 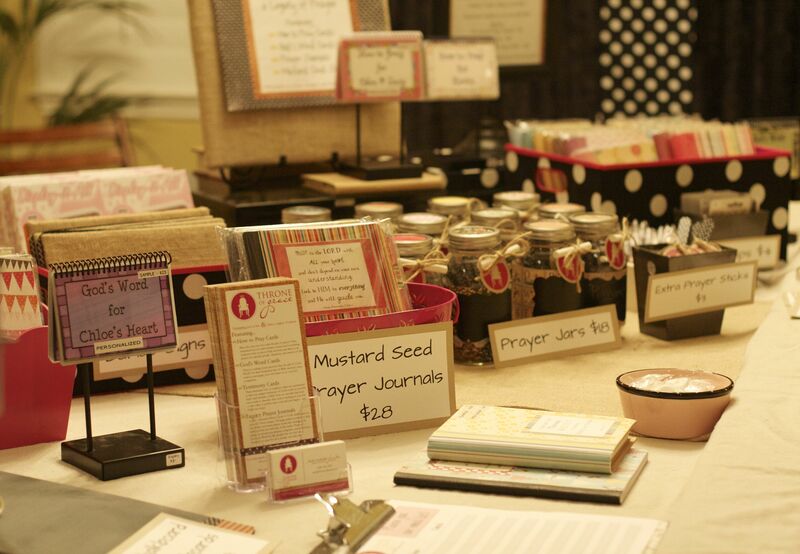 • Please join Karen in praising God for a wonderful women’s retreat weekend with New Life Church. Karen spoke 4 times over the course of the weekend on prayer and what a blessing to hear God made Himself so powerfully evident through the weekend! Let’s continue to pray that the seeds that were planted will grow deep and take root as the women return to life at home. Pray for all the women, including Karen, to be able to immediately put into practice the convictions of their heart. • As I mentioned, praise God for a fantastic first boutique! Our new products were very well received and even better than that – our message was well-received. We thank the Lord for some great opportunities to encourage, share, and even preach the Gospel that night! Please pray for one customer in particular who comes from a Jewish background but is non-practicing. She expressed frustration at not knowing how to pray herself, let alone teach her children to pray! We were able to share with her about Jesus being the fulfillment of God’s promised Messiah and then she asked us to pray with her! Let’s plead with the Lord to reveal Himself to her as the Messiah and remove her fears of betraying her family’s long-standing belief system. • Please keep praying for Deb’s mother-in-law, Ahn, who is having a very slow recovery from a concussion. Continue to pray for healing and the wisdom to rest and avoid the temptation to do too much! • I (Molly) would love continued prayers for my eyes and allergy issues. I am doing MUCH better than I was a week ago and have an appointment scheduled for this Friday for further allergy testing. It has been over 4 years since I was last tested. Pray that God will use the testing to help reveal a better plan of action and give my allergist and ophthalmologist combined wisdom to know how to manage my allergies and various eye issues better. • Lastly, Throne of Grace would appreciate continue prayers as we are in the height of the crazy boutique season. We’ve got another large local boutique this coming Saturday (the Queen Bee Market) and leave a week from Thursday for our road trip to Chandler Arizona for the Believe Boutique. Pray for good balance with home life and work commitments. Pray for God’s provisions, especially, with our trip – arranging care for children while we are gone, safety as we travel, and that the car top carrier we have been loaned (thank you, Esparza family!) will be sufficient to allow us to travel in one car with all personal luggage and our Thone of Grace goodies! Please submit your requests by Friday at NOON (pst). Yesterday I shared the story of Joshua’s Sun-Stand-Still Prayer from Joshua 10. If you missed that post, you’ll want to start HERE. The bolder our prayers, the more His answers unquestionably come from Him. Who could watch the sun refuse to set for an entire day and not call it an act of God?? As I began to take inventory of the prayers I was praying, I found that many of the answers I was looking for were things I could either essentially accomplish on my own, or could pretty easily take credit for accomplishing on my own. I was challenged to see that the Lord is glorified when my prayers require God-sized answers. “Lord, I pray that you will give me the time I need to accomplish the tasks put before me today.” That’s a pretty typical morning prayer for me. And there is nothing wrong with it. But I found that at the end of the day when my checklist is crossed off, I was patting myself on the back saying, “Good job! You did it!” Instead, I’ve begun to pray, “Lord, in the midst of all the interruptions and challenges to my day, I pray that you will allow me to accomplish the tasks that YOU have for me today.” For me, this is a bolder prayer because it is, in my mind, giving God “permission” to interrupt my plan, with the faith that He will work in me to accomplish His Sovereign Will for that day. Hopefully you are getting the picture. Satan wants to keep us from praying Sun-Stand-Still prayers. In my life, he uses fear. But God has graciously showed me that the fear of praying bold prayers is a result of my own pride. I don’t want to be wrong and I don’t want to look like a failure. If I pray boldly for something and God does not answer in the way I am asking, then I must have been wrong to pray for that. Or I must not have prayed hard enough. People will think I’m a fool to have prayed for something so boldly, only to see God not answer. It’s all about me! I want the glory for God’s answered prayer. SO not biblical! Right? However, when I take the step of faith to pray boldly, I am putting myself into the Lord’s hands. I know His answer is beyond my power to provide and my faith is grown by leaps and bounds when I see His answer. Yes, even when His answer is not what I asked for! There is humility there – we are approaching the throne of the King. There is boldness – it says “with confidence”. 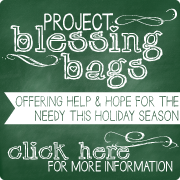 There is expectation that we will receive the mercy, grace, and help we need. That verse tells me that the Almighty God bends His ear to stop and hear the weak, whispered, jumbled, sometimes half-awake prayers of little ol’ me and little ol’ you! So even when God’s answer to my bold prayer does not come as I hoped or when I hoped, no prayer is wasted, because God never wastes our faith. There are some answers that we may never see this side of Heaven, but each prayer is heard and each prayer is working in us to build our faith and our relationship with Jesus. In fact, Revelation 8 tells us that one day each and every prayer of the saints, (that’s us, God’s people) will be poured out on the altar of the Lord. It’s a beautiful picture of the value of our prayers to the Lord! Our prayer today could be answered tomorrow, 5 months from now, or several generations down the road! Isaiah 65:24 says, “Before they call, I will answer.” Before we even pray them, our prayers are answered. We just have to wait in God’s timing to see the results. If these posts the last two days have resonated in your heart, I highly recommend reading Sun Stand Still by Steven Furtick. You can find the book HERE. It has been a life-changing book for me (Just in case you are wondering…I get no referral fee!) and I’m confident it will ignite a bigger passion in you too! Maybe it is time for you to rethink some of your prayers, too. Take a prayer you utter frequently and ask the Lord to show you how you can make it bolder. How can you make that prayer more FAITH-FILLED and more GLORIFYING TO GOD when He answers? Now, leave us a comment and share your prayer. Let us join you in asking the God of the Universe to bend His ear and stop the sun!